Yi Gate is also called the Da Cheng Gate. 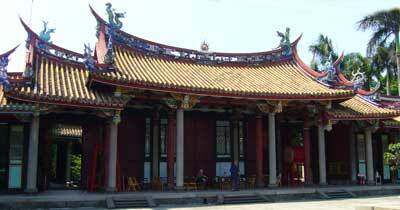 It is the main door to the Da Cheng Temple. The Yi Gate is as wide as five normal-sized rooms and there are doors on the left and right. On its left is the Jing Sheng Door and on the right is the Yu Zhen Door which are used on normal days.This kind of design is identical to the Qu Fu Confucius Temple. There are also stone pillars in the corridor of the Yi Gate, but there are no dragon carvings on the pillars and they look relatively simple. Koji pottery decoration is inlaid in its hallway walls, and the colors of these inlays are very graceful, and worthy of careful appreciation. The wood carvings in the windows on each side of the middle entrance (hornless dragons encircling a censer) are the most important of all. The hornless dragon is one of the nine sons of the dragon and was often carved on buildings or furniture in the old days. "Hornless dragons encircling a censer" is a pattern that uses several pairs of dragons to make a pattern of a censer. The lines of this pattern are smooth. Eight hornless dragons outline the shape of a censer on the Yi Gate of the Taipei Confucius Temple. The carving is refined and recognized as a masterpiece. A Yong bell and a Jin drum are placed inside the Yi Gate and are used in the Confucius ceremony. Look carefully at the wooden structure of the beams. Some ancient Chinese buildings don't have ceilings. This kind of style is called Lu Ming Zhao, a style in which there is no ceiling and the beams are visible. The beams must bear the weight of the roof but also look beautiful. The beams used in the Yi Gate are known as the "two beams three melon style". That is, there are two beams and three melon pillars. The melon pillars are shaped like pumpkins with whiskers that go down and wrap around the beams. This kind of structure is very sturdy and useful in a place like Taiwan where earthquakes are frequent. Another interesting feature is that the detailed carvings on the left and right beams are different. In the old days, when building a house, two craftsmen were often hired to carve the beams on each side respectively. The size of the beams would be the same, but the craftsmen could carve whatever they wanted. Wang Yi-shun, the designer, hired two groups of wood carvers to work on each side. Take a good look at the different carvings on the beams.